Labasa will play Suva while Lautoka will face Nadi in the semifinals of the 2018 Courts IDC. A ten men Labasa team beat a nine men Ba side 2-0 in the last Group A match to confirm their place in the semis. The two teams played a high intensity game throughout despite wet ground condition at the ANZ Stadium and players found major difficulties in moving the ball as heavy rain was experienced in Suva. Ba needed to score two clear goals to reach the semis but their hopes got shattered after Labasa's Siotame Kubu took a powerful shot from inside Ba's penalty box to score in the 10th minute of the first half. Labasa's second goal was scored in the dying stages of the game through a penalty which was taken by Pita Levaci. Ashnil Raju of Labasa played a grand game and provided his strikers with quality passes throughout. Ba's, Manasa Nawakula was red carded in the 14th minute of the first half after a dangerous foul on a Labasa player. There was a late drama where around 20 police officers had to come in the ground to control the situation as some Ba and Labasa players were involved in a scuffle. Ba goalkeeper Josaia Ratu and Labasa's Siotame Kubu were shown the red card after this incident. Labasa has topped Group A with nine points while Lautoka has finished second with six points. 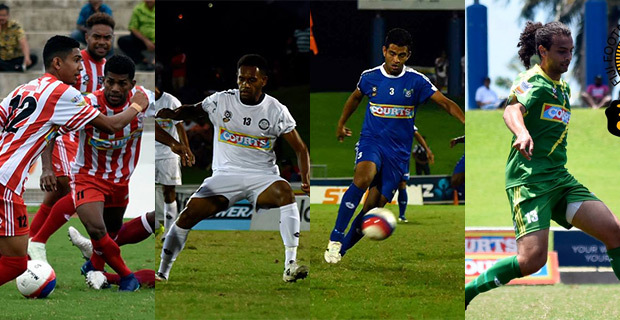 Nadi has topped Group B with nine points while Suva has finished second with six points. In other group matches today, Lautoka thumped Nasinu 8-0, Suva beat Tavua 2-0 and Nadi beat Rewa 3-1. The first semifinal between Labasa and Suva will start at 2.30pm while the second semi final between Lautoka and Nadi will start at 5pm on Tuesday. The final will be played at 3pm on Wednesday at the ANZ Stadium. You can catch the live commentaries of these matches on our sister station, Radio Sargam. Meanwhile, Navua will face Tailevu Naitasiri and Lami will play Nadroga in the senior semis.